What is your first thought when you hear “taking a leap of faith”? My mind sees images that are like cartoon action figures. 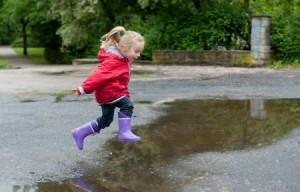 With my thought about taking a leap of faith, I imagine the joyous freedom of movement that I experienced as a six year old child leaping over puddles and running on the sand at the beach. Growing up in California gave me a unique experience of freedom that I met with open-hearted curiosity and joy. In my mind, the freedom and joy are translated into the image of having my arms wide open as I am leaping across a puddle not caring if I splash into the middle of it. I’m just going for it. That’s how it was for me when I started school. As Sister Maureen brought me and 49 other children into the 1st grade classroom on the morning of the first day of Catholic school, I was excited. The first thing that Sister taught was how to correctly hold a pencil to write. Now, looking back, it seems rudimentary. But, that morning, it was one of those “Aha!” moments that opened a door for me to new worlds. I was thrilled and could hardly wait to go out into the hallway to show my Mother what I had learned.